Kingsley decides to take of the content related to Lucious away from Empire X Stream, knowing it will cripple the finances of the Lyons. 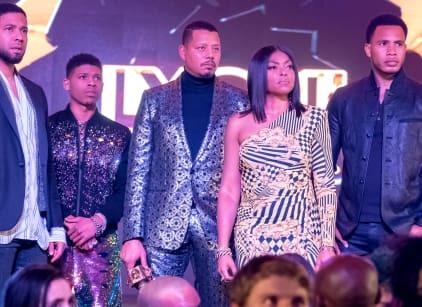 After much back and forth, Lucious shows up at Empire to attack Kingsley. In the process, Giselle appears and unveils that Lucious is his father. Lucious then visits Tracy and we are treated to another glimpse of the past with Lucious sleeping with Tracy and telling her to get out of his life years later. Kingsley later shows up at the LFM event, battered, and bruised and tells everyone the truth all the while saying Lucious abandoned him after getting his mom hooked on drugs. Meanwhile, we learn that Andre is in need of urgent healthcare in the future, fueling the fire that he's the one who dies. Elsewhere, Kai dumps Jamal after he learns shocking details about what Lucious has been hiding from everyone. Becky is fired from Empire. Permalink: Lucious, he's your son!